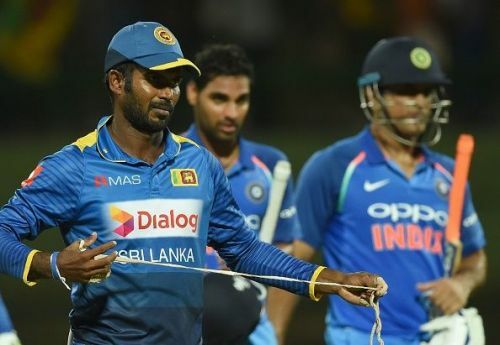 Sri Lankan ODI skipper Upul Tharanga has been suspended from Sri Lanka's next two ODI matches against India due to slow over-rate. Chamara Kapugedera has been chosen as the interim captain for the two games. 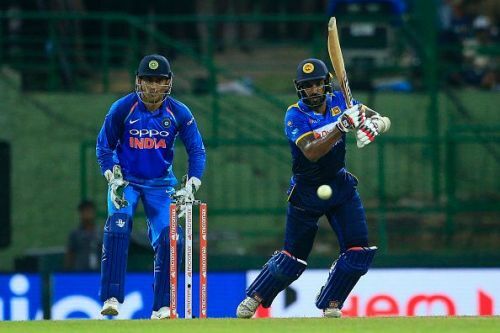 The right hand-left hand combination of Dinesh Chandimal and Lahiru Thirimanne has been recalled to the ODI squad courtesy Tharanga's unavailability. Sri Lanka are trailing 2-0 in the five-match ODI series at home, and losing their captain for the crucial third game is the last thing they needed right now. Danushka Gunathilaka is most likely to miss the next couple of games as well, pertaining to his shoulder injury. Thirimanne is most likely to open the innings in his place while Chandimal will look to cover for Tharanga at Number 4 in the batting order. India managed to win the second game of the match and snatched victory from the claws of defeat. The hosts had managed to pull things back brilliantly after a successful opening partnership between Rohit Sharma and Shikhar Dhawan. They picked 7 wickets for 22 runs and finally looked on the verge of winning their first game of the tour. However, it was not to be. MS Dhoni and Bhuvneshwar Kumar scripted a composed comeback for the Indian side and stitched a century partnership to take India home. The more they played, the more it frustrated the Sri Lankan team and captain. It ended with a slow over-rate for the former and a suspension for the latter! Tharanga has already been banned for slow over-rate earlier this year, who led the side in the absence of Angelo Mathews in the opening game of the Champions Trophy 2017. The over-rate rule: In ODI cricket, the bowling side should bowl their quota of overs 210 minutes as per standard ICC rules. The actual number of minutes that the side gets is 200, as 10 minutes of the total time is allotted for the drinks breaks. Thus, the standard over-rate of an innings should be 15 overs per hour. The issue of suspensions and match bans for the captain is raised if the over-rate of the innings falls below 14.28 overs per hour. However, the number might vary slightly depending on the circumstances around every match. Hence, the umpires calculate the over-rate after every match and submit their reports regarding the same. Sri Lanka's over-rate for the second ODI did not cross this threshold put forth by the umpires, thereby resulting in the captain landing a two-match ban.